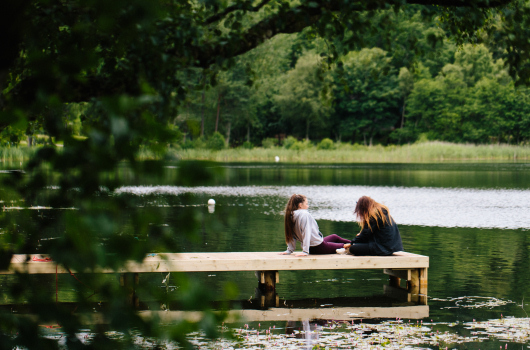 Loch Monzievaird offers great accommodation in surroundings full of natural beauty and interest. 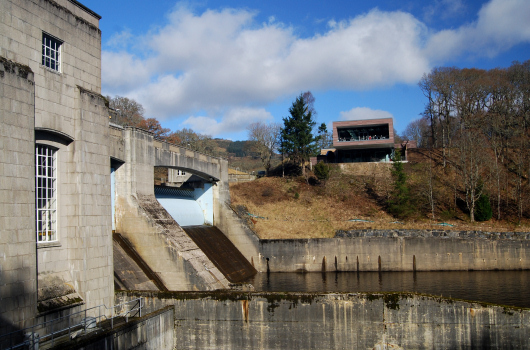 This area of Highland Perthshire abounds with wildlife and activities, and it is also a convenient centre from which to tour other parts of Scotland. King Kenneth 1V of Scotland was killed at the battle of Monzievaird in 1003. On the north side of the loch, on what was known as the 'Dry Isle', are the remains of an old fortress called Castle Cluggy. This was the original home of the lairds of Ochtertyre. The fortress was referred to as 'ancient' in a charter of 1467. It belonged to the Red Comyn, who was killed by Robert the Bruce in the convent of the Minorites at Dumfries. It is thought that Sir William Murray last inhabited the castle in the middle of the 17th century. About 80 yards to the west of the ruin is a small artificial island that served as a prison. 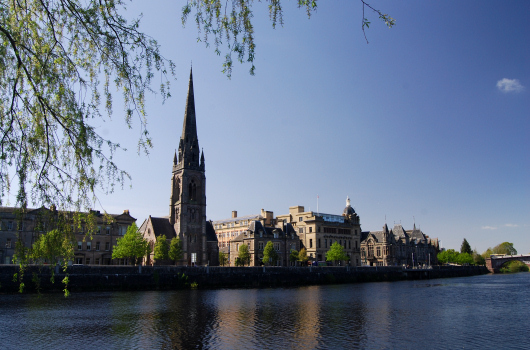 At the west end of the loch is a large mound where plague victims were buried in the reign of Charles 1. 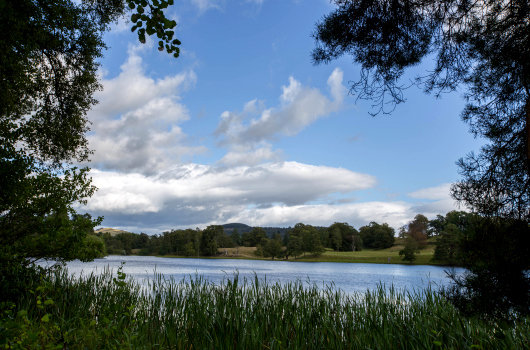 The grounds in which our self catering holiday lodges are located are part of a designed landscape, which began with the building of Ochtertyre House as the Murray family seat in Perthshire between 1784 and 1790. This is a Georgian Category A listed building that looks out over Loch Monzievaird from an elevated position. It is now a private house, but in its time it has been a school (Seymour Lodge 1939-1965), a theatre and a restaurant. 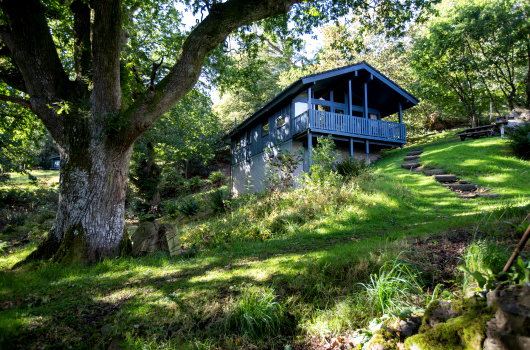 The self catering accommodation was developed under separate ownership from Ochtertyre Estate and is contained within an area of approximately 40 acres at the west end of Loch Monzievaird, including the original Gamekeeper's Lodge. The designed landscape has been described in many articles over the years and has been quoted as having 'outstanding architectural value', as making a 'significant contribution to the local scenery', and providing 'the highest values in nature conservation'. Our grounds are protected by Historic Scotland. 19th century accounts of Ochtertyre describe fine trees 'harmoniously grouped' in the grounds. The woodlands were established as part of the designed landscape in the latter half of the 18th century. They include many two and three hundred-year-old oak, ash, beech and Scots pine trees. There are also some other interesting varieties marked for public knowledge. Has formed a perfect fairyland? 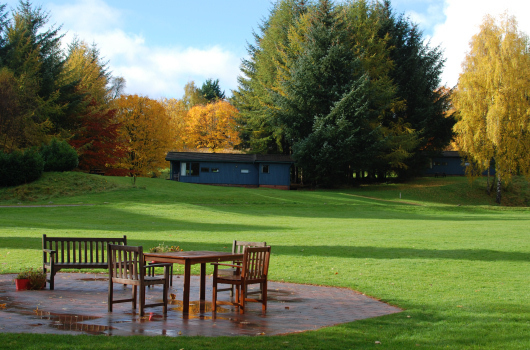 There are plenty of open areas for play or relaxation, and lovely walks in and from the grounds. The emphasis here is on peace and tranquillity. 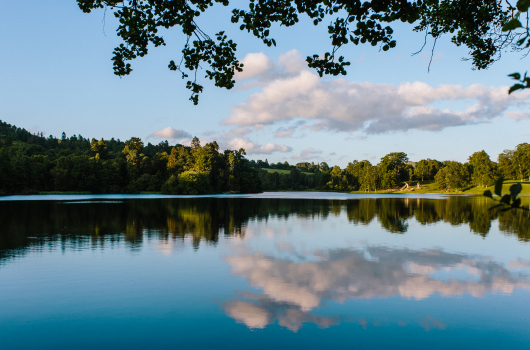 On-site seasonal leisure facilities include a tennis court, Frisbee golf course, foot golf, game room (availability during high season) and a disc golf course, as well as boating and a pedalo on the loch. 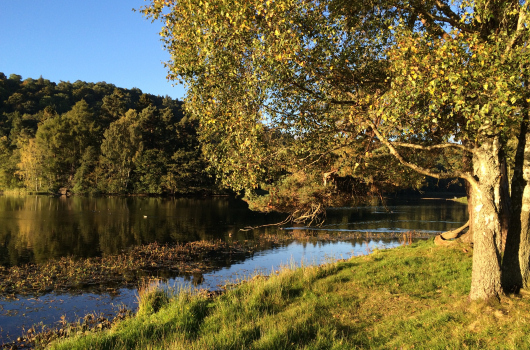 Loch Monzievaird is situated just two miles west of Crieff in Highland Perthshire. 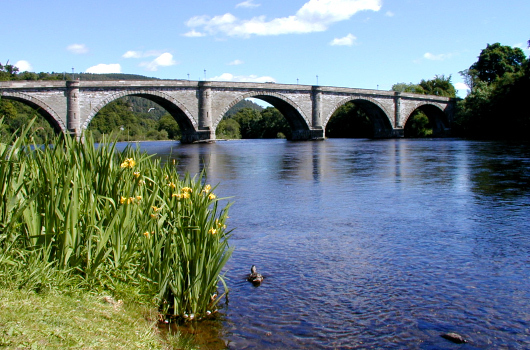 Many other famous Perthshire towns are within easy reach, including Aberfeldy, Dunkeld, Perth and Pitlochry. Perthshire is ideal for a golfing holiday in Scotland. There are thirty golf courses in the 'Big County', ranging from small Highland nine-hole courses to eighteen-hole championship courses. From Monzievaird, there are around twenty golf courses within thirty minutes by car. Two of the world's most famous golf courses - Carnoustie and the Old Course in St Andrews - are only about one hour away. Fishing can be arranged locally. We have three fibre-glass boats in the boat house on Loch Monzievaird and access to a lovely beat on the River Earn less than a mile away.